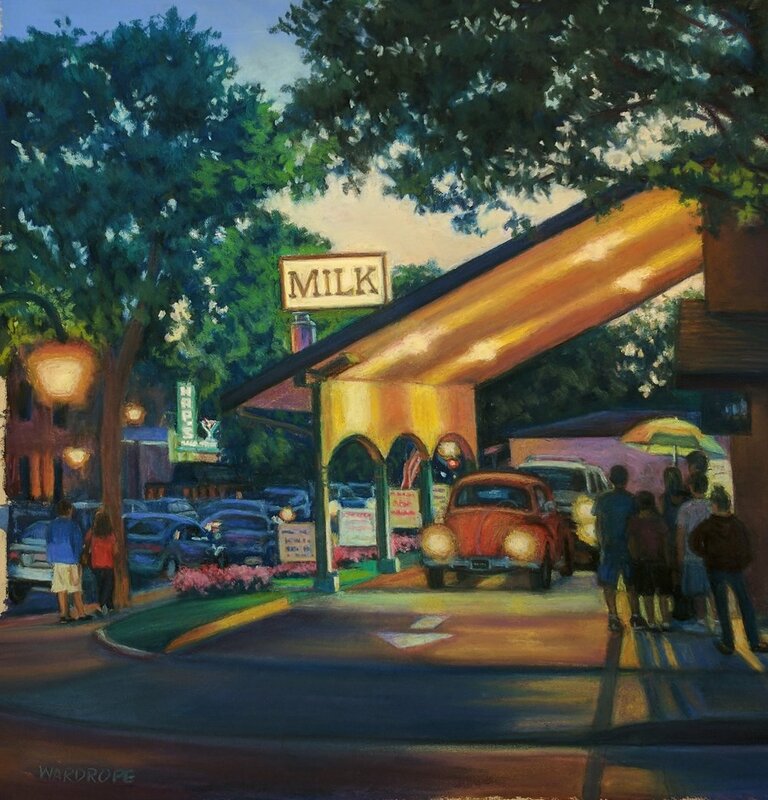 Come join us on a Saturday and meet oil painter Tom Taneyhill. Tom is inspired by our California landscape and creates with color and texture. Meet acrylic abstract painter Courtney Jacobs, talk with her about her process of blending, scraping and adding texture to her pieces. Courtney is always seeking balance between the positive and negative spaces of light and dark. Meet Hallmark artist James R. Tracey, come talk with James about his technique of pen, ink and tempura, watch as he creates a piece here in the gallery. Join us for this glass event and meet Gig Erickson, enjoy her gorgeous glass and see her new wall art and table lamp pieces. Join us Saturday April 20th and meet Pleasanton artist Amy Leung, come talk with her about her craft, her process and watch her work on a piece of art. Meet Irene Hardy, talk with her about her inspiration for her paintings and watch as she creates her jewelry with acrylic paint. Each piece of jewelry is framed in silver plate and covered with domed glass, every piece is one of a kind. Come meet Modesto oil painter Tyler Abshier, come talk with him about his inspiration and his technique. Meet surrealist oil painter Bill Sala, come talk with him about his process and his 70 plus years of creating art. Come see his new work that depicts the depression era. Join us and meet local sculptor Julie Koopmann, talk with her about her love of elephants and how she creates them with clay. Debbie Wardrope is a longtime Pleasanton resident who has always loved art and has pursued painting throughout her life. Debbie believes art should be beautiful, accessible and evoke images that are immediately recognizable, but are things that are frequently overlooked in the rush of our every day lives. She loves to capture a moment in time through the use of light and color. Debbie has painted several painting’s of downtown Pleasanton, these pieces are available here at Studio Seven Arts. Join us for this fun Saturday filled with art, featuring Debbie Wardrope. Meet her, talk with her about her creation process and watch as she demonstrates her craft. The result of her decision can be seen on here website Jujukoop.com and her elephant sculptures can be seen here at Studio Seven Arts, each one unique with its own personality. The artist, long dormant in her awoke with a new creative energy and multiple sources of inspiration, she began sculpting forms and figures with uninterrupted single strings of wire. As Julie began twisting and turning unique characters evolved, each with their own identifiable personalities and style. Her heroes. some super, some emotional and some lost were within these sculptures. She designed wardrobes by a creative application of dried acrylic paint and each was complete. Julie’s initial contact with clay did not feel new or foreign to her, but rather old and familiar, like a long lost friend. Magically she sculpted two busts of father figures she had loved who had passed away. Both of these pieces are in homes now of loved ones, who tell her they help fill a void and inspire fond memorizes. Julie loves working with clay because in it’s wet state it is malleable: but after the firing it is rock solid and long living. Julie has a enormous heart for elephants. Their majestic presence is unforgettable. Although their skin looks rough and tough, it is sensitive and easily permeated by poacher’s arrows, those that are hungry for their long white ivory tusks. They along with Rhino’s are in the same category, endangered in many parts of the world, some breeds are close to extinction. Julie’s passion for sculpting them is to bring awareness to their plight. If you want to see some amazing orphaned baby elephants Julie recommends the work that is being done at www.davidsheldricktrust.org better yet she said adopt one for a year and watch it grow! Julie believes that Art encapsulates time between the artist and the enthusiast, it is that mysterious connection that captivates and motivates her as an artist. The Pleasanton Downtown Association (PDA) is excited to announce the 8th annual Halloween Brew Crawl coming to Downtown Pleasanton on Saturday, October 27 from 5 -8 p.m. Trick or Treating isn't only for kids, adults can have their fun too! Stroll (or crawl) through beautiful Downtown Pleasanton and sip on craft brews, ciders and mead while enjoying tasty bites along the way at 30+ downtown locations! Tickets will go on sale Wednesday, September 19th early bird pricing is $40 and will run throughout September. On October 1st tickets will increase to $45 and will run until sold out, or midnight on October 26th. If available tickets will be $50 cash or check only at check in. Check in location will be the Veterans Memorial Building located at 301 Main Street. Calling all little ghouls, witches, princesses and super heroes to downtown Pleasanton. The annual Halloween Scavenger Hunt will take place on Saturday, October 20 from 10 a.m. to 12 p.m. while supplies last. Children 10 years old and younger are invited to come in costume and pick up instructions from the starting location outside of the Museum on Main at 603 Main Street. *Please note treats will be limited to the first 600 children. Children have to solve the clue in order to find the next downtown location, where they will be given a small goodie or treat. Parents will be given the clue and answer sheet to help children find the treat locations. Check back for more details or email events@pleasantondowntown.net. The Fall Antique & Collectibles Faire is returning to Downtown Pleasanton on Sunday, October 14th from 8:00 a.m. - 4:00 p.m. The Pleasanton Downtown Antiques and Collectibles Faire is run by Jerry Goldman. If you need dealer or show information, please contact Jerry at Turn Key Show Productions, (510) 972-0613 email jerry@turnkeyprod.com, or www.pleasantonantiquefaire.com. Join us here Saturday October 13th, from 10:00 AM to 2:00 PM, meet Charity and watch as she creates a painting. Talk with her and enjoy the gallery during the fall season. Nature has always spoken to Charity Anderson. Born in 1991, Charity grew up against the backdrop of the Logan River and the northernmost branch of the Wasatch Mountains. Being raised in Cache Valley, Utah helped cultivate her love for the outdoors. While attending college at Brigham Young University-Idaho, Charity's life changed with the introduction of oil painting. She quickly became captivated with the medium, and expressed that mixing the smooth oil paint was "exhilarating." Soon after being introduced to oils, Charity took her first plein air class and was delighted in the experience of merging her two passions, nature and painting. Today she continues to regularly paint on location, observing nature and recording her experience through oil painting studies. Anderson graduated with a Bachelor's of Fine Arts from Brigham Young University-Idaho in 2015. One year later she moved to Northern California and currently enjoys trying to capture the diverse landscape in the Bay Area. Through her developing skills, Charity strives to celebrate the beauty of nature by recording the fleeting, sacred moments of the outdoors. Her hope is to visually convey the connections she feels with nature. Throughout Stephen McMillan’s life, he has been inspired and sustained by the natural world, he has spent much of his time outside. Whether Stephen is on a bike ride in the Sonoma countryside or a week long backpacking trip in the High Sierra, he is renewed and invigorated by being in and moving through the landscape. Stephen was born in Berkeley, California and was raised in a home that had a sweeping view of the San Francsico Bay. This scene kindled his interest in landscape and was one of his earliest drawing subjects. He had his first one man show when he was sixteen. Stephen McMillan studied at the University of California, Santa Cruz and for one year at Hornsey College of Art in London, England, where he concentrated on sculpture. It was in Santa Cruz, in 1969, that Stephen was first introduced to etching. Since he received his BFA from UCSC in 1975, he has focused on creating aquatint etchings of the wilderness landscapes, drawn freehand from photographs he takes. We carry a large selection of Stephens etchings here at Studio Seven Arts, come take a look at his amazing creations and meet him during this special Sunday event, join us for wine and treats, there will be special pricing on Stephens pieces during the event.